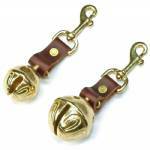 This premium quality bear bell features a new solid-brass petal bell fastened to a sturdy snap with a loop of weather-resistant leather. The bell can be fastened to a dog, backpack, walking staff, horse, or bicycle to warn away pheasants, quail, bears, and other wildlife as you hike or walk your dog. The bell will also alert other people to your presence when visibility is limited. People also fasten these bells to their motorcycles as a good luck charm. Your choice of bell size -- #2 (1 1/4" across) or #4 (1 1/2"). The larger bell is bulkier, but the sound is louder and has a lower pitch compared with the smaller bell.